Sporty versions of mid-size sedans are all the rage, apparently. Toyota is even rumored to have a TRD version of the Camry in the works. Not to be outdone, Volkswagen looks like it’s giving the GT treatment to the 2018 Passat. Officially just a concept for now, the Passat GT is a new “sporty” four-door, with “sporty” very much in quotation marks. Do any of you want that? VW thinks you do. Visually, the GT has red lipstick around the grille, some aggressive air fake intakes, and the all important GT badge on the doors. The last one is very important, especially for those of you old enough to remember Honda’s VTEC door decals. It’s what tells you a car is really meant for speed. The bummer is that the car’s drivetrain is unchanged. Under the hood is the same 3.6 liter V-6 in the current Passat making the same 280 horsepower. It’s mated to a six-speed DSG dual-clutch automatic transmission. The chassis does get some modification, though. 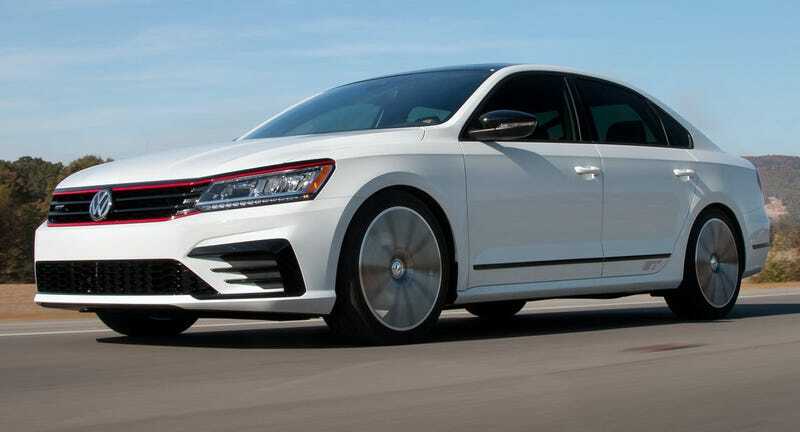 The Passat GT comes with 19' Tornado wheels and the suspension has been dropped 0.6 inches, which pretty much makes it hella-flushed. Kinda. Not quite. Also neat are trapezoidal exhaust outlets, supposed to compliment the deck spoiler and smoked taillights that I imagine came from a Neuspeed catalog. While not yet a production car, you can probably expect to see the Passat GT in the driveway of some poor soul who wanted to buy a GTI, but the full-size opulence of a Passat was a better choice.